Scrutiny for a state child care program. Prompted in part by a newspaper&apos;s investigation of fraud and abuse in the taxpayer funded Wisconsin Shares child care program, a legislative committee has ordered an audit of the program. "The legislative audit committee is putting the cheats on notice," said state Representative Peter Barca, who co-chairs the Joint Committee on Audit. "We will not tolerate any cheats of public assistance in Wisconsin." An investigation by the Milwaukee Journal Sentinel discovered widespread fraud and abuse in the program. There may have been little incentive for local authorities to pursue allegations, according to state Senator Bob Jauch. "Because any of the money that we would collect through fraud and abuse (investigations) goes back to Washington D.C.," said Jauch. "We have to be willing to provide the resources, but to also make sure that when counties do that, they&apos;re able to collect some of the dollars." "Unlike many program audits, this audit is going to be done while changes are ongoing," said audit committee co-chair, state Senator Kathleen Vinehout. "It will immediately recommend changes that can be incorporated into the public budgeting process." 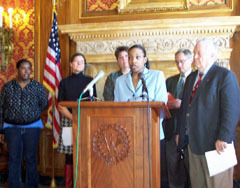 "Whle the audit will address procedures and policies, and try to identify the causes and consequences of fraud and abuse, it is important that we emphasize that not one bit of our discussion should overshadow the honesty and excellent care, provided to thousands of children across Wisconsin," said Jauch, who chairs the Senate Committee on Children and Families. "I caution against blaming an entire program for illicit activities of a few," said state Representative Tamara Grigsby, who chairs the Assembly Committee on Children and Families. "We must seek out fraud, yet maintain the vital services for those who so desperately need it." Barca said providers attempting to cheat the program need to know that they&apos;ll be identified and disqualified, and if they&apos;re breaking the law, prosecuted as well.